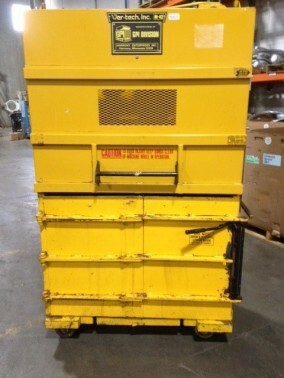 Ver-tech/GPI Model 2242 baler. Operate on 120 volt single phase power and produce 42” by 30” by 24 “ bales. Ideal machine for baling cardboard, plastic, textiles, clothing stretch film and shrink wrap. As is. In stock and ready to ship.